Taiwanese smartphone maker HTC is going to announce its HTC One M8s, which is a lesser performing variant of the company’s One M8. If consumers were to take a quick glance at both devices, it would be hard to distinguish between them, seeing as how the company’s official specifications state that there is only a 0.2 mm difference concerning the maximum thickness of both smartphones. However, dig deeper in the smartphone and users will find plenty of things that separate both handsets. 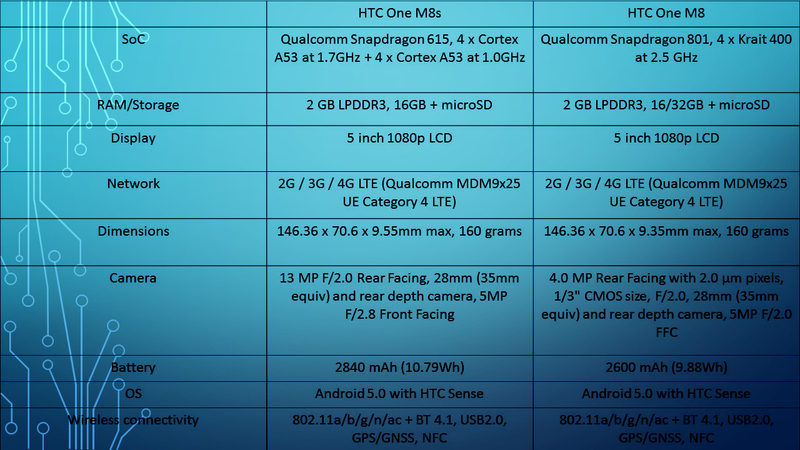 Performance between the two smartphones is going to be a ‘no contest’ match since One M8’s Snapdragon 801 will make short work of Snapdragon 615 present inside HTC One M8s. While the handsets share the same chassis and design, along with similar cellular connectivity and display, HTC One M8s is able to excel against One M8 since it possesses a Bluetooth 4.1 module compared to 4.0 present on the former flagship model. Additionally, HTC One M8s also features a larger battery than One M8; 2,840 mAh against 2,600 mAh. 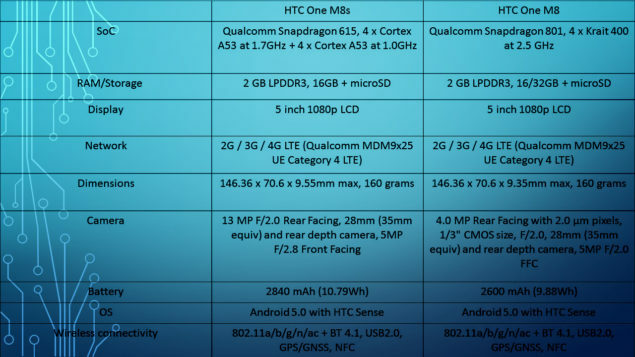 If HTC One M8s was equipped with ARM’s Cortex-A57 processor, then the handset might end up draining battery more rapidly compared to its similar designed cousin, since it has been known that Cortex-A57 consumes 256 percent more power compared to Cortex-A53, even though it is able to deliver 56 percent more performance than the latter. The last major difference between the two smartphones was the camera sensor present on HTC One M8s and One M8. While the one placed on the latter comprises up of a 4 MP “UltraPixel” sensor, the company decided to incorporate 13 MP on the lesser performing variant. Considering that HTC One M8 was the flagship offering of the Taiwanese tech firm, we cannot conclude to say that the company’s One M8s will be stacked up in the same category, although we are at liberty to state that the device comes very close to the hardware specifications of HTC Desire 826, a mid-ranged handset. 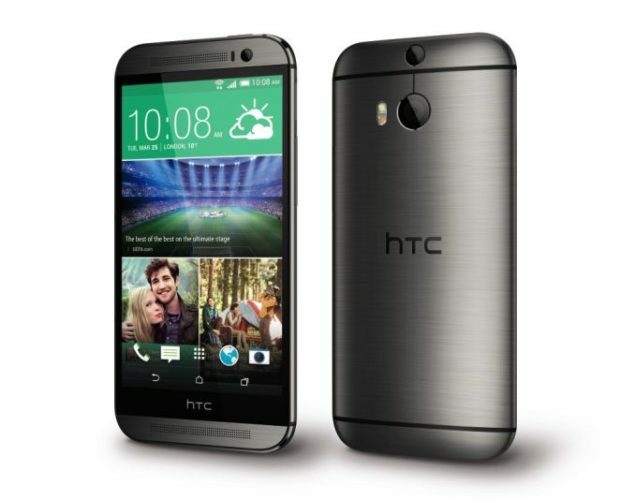 The only difference between HTC One M8s and Desire 826 is the battery pack, screen size and most likely the price. Furthermore, the handset is going to carry a retail price of £379.99 in the United Kingdom, which translates it in to $564.58 USD. For a device that near equals Desire 826 in hardware specifications and costs higher than Xiaomi’s Mi Note Pro, we are inclined to say that HTC has gone forward and overpriced the handset, and before you ask, it is not a smartphone that we will be enticed to purchase. Why Didn’t HTC Just Make the U12 Instead of Releasing the U12 Plus Straightaway?